This is a short summary of how Telegraph Hill got its name and what the telegraph did. A longer history of the telegraph, with details of how it worked, is published by the Telegraph Hill Society as Historial Note No 4. In 1794 our hill was known as Plow'd Garlic Hill as it had been since the middle ages -- most possibly a reference to the marketing gardening which took place here. To the north were field and to the south, the remnants of the Great West Wood. All that was about to change. Britain was at war with France and the Admiralty needed a faster means tocommunicate to its fleet moored on the South Coast than could be achieved by rider on horseback. The Semaphore Telegraph system involved a chain of buildings each on a prominent hill-toand each bearing a series of eight shutters on their roofs. The shutters were opened and closed by means of levers and each of the 63 different open or closed shutter combinations signified a different letter or word. Each building in the chain could be observed from the next in line and, by this means, a message passed along the chain. 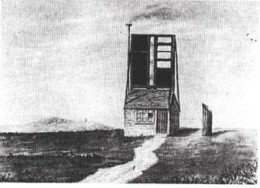 The Telegraph Hill semaphore station (pictured above right,from any early engraving) was established in 1795 and was the third in line from the Admiralty. The messages went from there to St George's in the Fields, then Telegraph Hill, then Shooter's Hill and on to Deal and Dover. A second route, established later, went down to Portsmouth via One Tree Hill. Why this location for the telegraph? You only need to go there today to see that it commands impressive views over Central London. The picture on the left shows the view from the site, with Hampstead Heights and Alexandra Palace on the horizon. St Paul's and the Palace of Westminster are easily viewable. The views to the south and east - down the telegraph chain - have been obscured by Victorian development although it is said that before South London was built up Knockholt and Sevenoaks could be seen on a fine day. The telegraph's high point came with the signalling of Wellington's victory at Waterloo and with Nelson's defeat of Bonaparte at Trafalgar and the surrender of the French forces, the telegraph's days of glory were almost over. A new single mast telegraph was tried out in 1816, and a system with rotating pointers tried in 1824 finally reverting to the six shutter type until its demise in 1836. That demise came as the railways came to New Cross Gate and, with the railways, faster and more secure means of communications rapidly followed. It is a strange coincidence that the first examples of railway semaphore signalling were also tried out at New Cross only a few years later. That too has almost gone -- leaving only the name of Telegraph Hill as a reminder of the early days of automated communications.